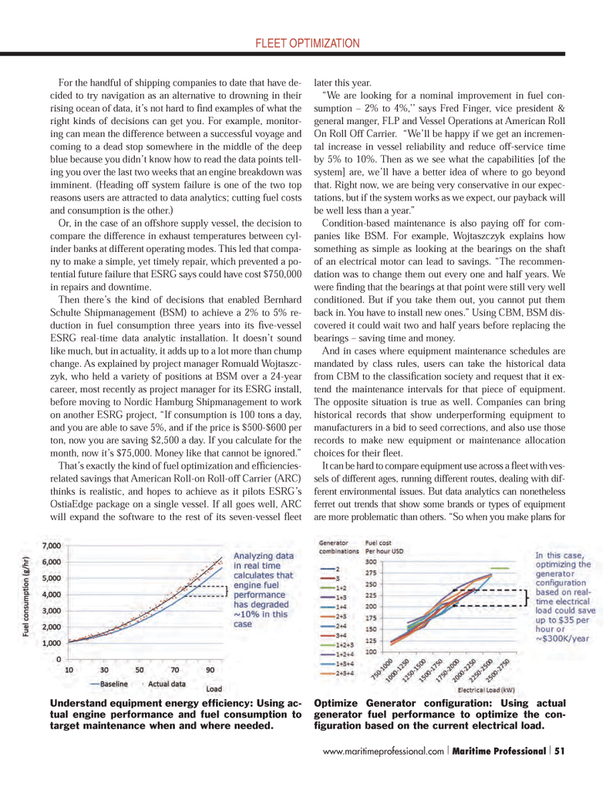 Or, in the case of an offshore supply vessel, the decision to compare the difference in exhaust temperatures between cyl- inder banks at different operating modes. This led that compa- ny to make a simple, yet timely repair, which prevented a po- tential future failure that ESRG says could have cost $750,000 in repairs and downtime. Condition-based maintenance is also paying off for com- panies like BSM. For example, Wojtaszczyk explains how something as simple as looking at the bearings on the shaft of an electrical motor can lead to savings. “The recommen- dation was to change them out every one and half years. We were fi nding that the bearings at that point were still very well conditioned. But if you take them out, you cannot put them back in. You have to install new ones.” Using CBM, BSM dis- covered it could wait two and half years before replacing the bearings – saving time and money. And in cases where equipment maintenance schedules are mandated by class rules, users can take the historical data from CBM to the classifi cation society and request that it ex- tend the maintenance intervals for that piece of equipment. The opposite situation is true as well. Companies can bring historical records that show underperforming equipment to manufacturers in a bid to seed corrections, and also use those records to make new equipment or maintenance allocation choices for their fl eet. Understand equipment energy effi ciency: Using ac- tual engine performance and fuel consumption to target maintenance when and where needed.